$140.00 Soviet State Emblem from Railroad Car in cast aluminum, circa 1970s-80s. Impressive display piece. $90.00 Ladies Kremlin Perfume Flask in hallmarked "875" silver and a 1968 maker mark. An elegant status symbol item possibly once used by a wife or daughter of a Communist Party VIP. $30.00 Ladies Compact in silver-plated brass, decorated with florals, circa 1950s-60s. This very elegant piece makes a full impression of solid silver. Includes original mirror. In excellent condition. $30.00 Small size Ladies Compact in silver-plated brass, circa late 1940s-1950s. Uncommon "Art Deco" design. Maker marked by the "30th Anniversary of the October" workshop in Kiev. In very good condition. $40.00 Ladies Compact in hallmarked silver, 1967. Attractive piece featuring engraved flowers and gilded interior. Very good to excellent condition. $140.00 The 1957 Youth Festival in Kiev, exquisite hand blown art glass vase, layered milk glass with gold leaf trim and artwork showing the festival badge and happy Ukrainian youths. $140.00 Elegant Vase in Milk Glass commemorating the VSKhV Agricultural Exhibition in Moscow, 1954-59. Double layered, with attractive artwork vignette of the emblem of the exhibit depicting a male and female collective farmers holding a sheath of wheat. In very good condition. $125.00 Elegant Vase in Milk Glass featuring the classic Horse Tamer statue in Leningrad, circa 1950s-60s. Double layered, with vignette showing one of the most recognizable of all Leningrad / St. Petersburg landmarks. An attractive and timeless piece in very good condition. $170.00 Vase in Milk Glass featuring young Soviet athletes, circa 1950s-60s.The artwork includes flags of the three branches of the Soviet armed forces and the arms conveying the message that the main purpose of sports in the USSR was to train soldiers. In excellent condition. $220.00 The Glider Model Builder (Planeristka), circa 1930s-50s, a faience statuette of a Young Pioneer based on the 1930s design by D. Kovalenko. $80.00 Desktop plaque with sculptured profile of Yuri Gagarin, world's first man in space, 1970s - 80s. Marked with the name of the acclaimed Soviet sculptor Sokolov who created the portrait and the logo of the Leningrad Mint. Includes a wire stand to display on a desk as well as a wall mount. In excellent, near mint condition. $80.00 Lady's Wind-Up Music Box with Storage Container for Jewelry or Trinkets. Featuring various buildings of the VDNKh Exhibition in Moscow, it plays a sentimental melody of the "Podmoskovnye Vechera" ("Evenings in Moscow Suburbs") every time the lid is lifted - apparently to put the owner in a romantic mood. A great piece of Soviet kitsch! $40.00 Lady's Compact "Greetings to the Participants of the Festival, Moscow, 1957", stainless steel and silvered copper. The Festival was the Sixth World Youth and Students Festival, one of the most massive propaganda events held in the USSR. $225.00 Moscow Kremlin silver gilt woman's compact, Leningrad Jewelry and Watch Factory; hallmark dates to either 1957 or 1967. Enameled plaque on the obverse shows a view of the Kremlin as seen from the Moskva River. $45.00 Candy tin from Kazan in the Tatar Autonomous Soviet Socialist Republic (within the Russian SFSR), circa 1950s, originally held hard caramel candies called "Monpans'e". $30.00 The building of the Ukrainian Supreme Soviet decorates a tin for an unknown product, circa 1960s. Other prominent locations in Kiev decorate the sides of this container. $60.00 Svoboda Brand All-Union Agricultural Exhibition Tooth Powder Tin, 1959. Features a view of the main building of the famous VSKhV fairgrounds in Moscow. 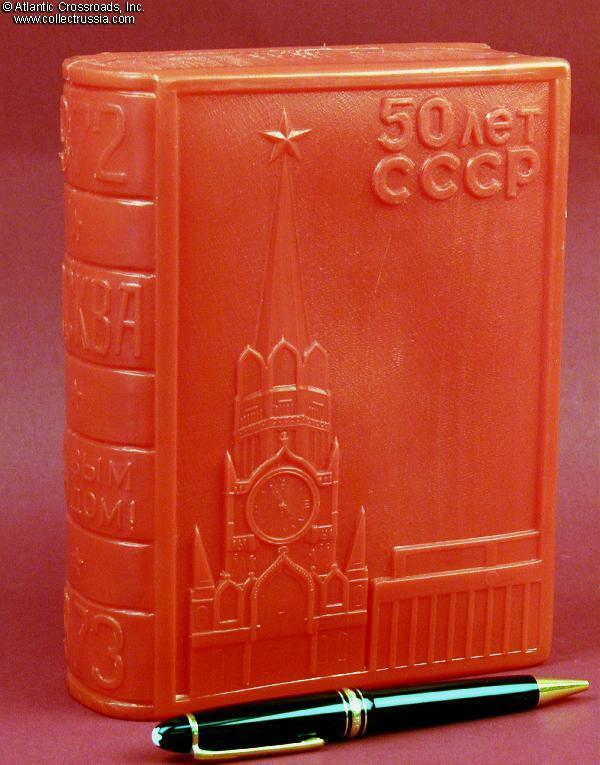 $59.00 Moscow Kremlin Candy Tin, circa 1960, features a view of St Basil's Cathedral, the Kremlin's Savior Tower, and Red Square from the south. $65.00 Holiday greetings! Candy tin, circa 1950s-1960s. Typical item sold at candy counters for giving to friends and relatives at holiday time. Nice view of the Kremlin walls and the Moscow skyline with one of Stalin's skyscrapers added for good measure. $120.00 Tin from the famous Red October confectionery factory in Moscow, pre-1946. Located just across the Moskva River from the Kremlin, the factory frequently filled the entire area around Red Square with the aroma of chocolate! $75.00 All-Union Agricultural Exhibition Keepsake or Souvenir Box, circa mid-1950s. Features a view of the main building of the VSKhV fairgrounds in Moscow (later it became the famous VDNKh). Made of a bakelite type of plastic. $69.00 Exhibition of Achievements of the National Economy or ВДНХ (VDNKh) Keepsake or Souvenir Box, circa 1959. Features a view of the main building of the VDNKh fairgrounds in Moscow. $115.00 Stalin Birthplace Shrine Sewing Box, Tbilisi-made, bone-colored plastic box, circa 1950. $45.00 Grandfather Frost (Ded Moroz) holiday souvenir or keepsake box, circa 1950s. Made of a sturdy bakelite type of white plastic. $75.00 "The Red Army Sings!" a recording of the Red Army Song and Dance Ensemble; "Latest Selected 12 Songs", six 78 rpm 10" records, produced in NYC during the 1940s from master recordings cut in the Soviet Union. Complete in original album. $45.00 Victory over Germany Commemorative Podstakannik tea glass holder, circa 1960s-70s. This attractive piece in Melchior "nickel silver" was probably meant to be given as a gift to a WW2 veteran. Features the famous Monument to WW2 Soviet Soldier in Berlin's Treptower Park. In excellent condition. $80.00 XXV Party Congress Commemorative podstakanniki, attractive metal tea glass holders, circa 1976 limited edition, a SET of TWO with "deluxe" Glass Inserts. Design features the massive Palace of Congresses inside Moscow Kremlin. Great for display next to the family samovar. Made of Melchior, a high quality "nickel silver" alloy. In excellent condition. $75.00 Podstakanniki Tea Glass Holders a matching SET OF TWO, Limited Edition in Commemoration of the Bicentenary of the USSR, 1972. Quality pieces in Melchior "nickel silver" alloy. Attractive artwork features the Spassky Clock Tower of the Moscow Kremlin and the domed Supreme Soviet building. Both are in excellent condition. $40.00 A pair of souvenir Volgograd podstakanniki, two teacup holders featuring Stalingrad's post WW2 name in English, Spanish, German, and Russian. Sturdy anodized aluminum construction. Circa 1970s-80s. $19.00 Space exploration podstakannik celebrate the concept of a Soviet "Cosmos" by showing rockets, stars and planets. Sturdy aluminum construction with original, official Soviet era price of 1 ruble 70 kopecks stamped on the bottom. Circa 1960s. $30.00 Cosmos Podstakannik metal tea glass holder features an allegorical female (Greek Goddess? Ethereal Collective Farmer?) launching a Sputnik from the Kremlin's threshold, circa late 1950s - 1960s. Made of Melchior, a "nickel silver" alloy traditionally used in Russia for fine art castings. In excellent condition. $55.00 Soviet Space exploration Podstakanniki, "Cosmos"- themed, attractively designed and sturdy metal tea glass holders, a SET OF TWO with Glass Inserts. Great items for display next to the family samovar in your dining room. Made of Melchior, a "nickel silver" alloy traditionally used in Russia for fine art castings. In excellent condition. $40.00 Heavy duty 1/4 liter Soviet Beer or kvas Mugs, set of two. Handy size. Kvas is a fermented brew made from bread, popular for centuries in Russia, and perfect for quenching your thirst if you lived in a country without access to Coke or Pepsi! $95.00 Rooster Cruet Set in Porcelain, Gorodnitsa, circa 1962. A handsome pair, perfect for brightening a kitchen shelf. Very good to excellent condition. $25.00 A pair of Outer Space "Cosmos"-themed tablespoon /serving spoons. Stainless steel, circa 1960s-1970s. Each is 8 1/8" long. $60.00 Cast Iron Pressing Iron circa 1920s-1930s made by the "GPK" Factory in the city of Krivoi Rog in the Ukraine. Hinged top opens to allow a housewife or a tailor to insert hot coals. 7 1/8" tall, 4" wide, 7 3/4" long. $80.00 Cast Iron Pressing Iron circa 1920s-1930s made by the Kasimov Factory in the RSFSR. Hinged top opens to allow a housewife or a tailor to insert hot coals. 7" tall, 4" wide, 7 3/4" long. $925.00 Harvest, Collective Farmer / Peasant Girl pen and pencil holder, Lomonosov (LFZ), circa 1950s, very uncommon and hard to locate porcelain figurine of a young woman standing on the edge of a wheat field at harvest time. The perfect embodiment of Socialist Realism! Excellent condition. To see a wide selection of the porcelain figurines once found in homes and offices all over the Soviet Union, please visit the Soviet Porcelain section of our website. $55.00 Rooster and Snail Porcelain Vase or Pencil Holder, Gorodnitsa, 1950-62, perfect decoration for your home in the country! 7 3/4" tall. Excellent condition. Ideal for keeping track of artists' brushes, too. $90.00 Oval wall plaque with bas-relief portrait of Russia's Greatest Poet, Alexander Pushkin, circa 1960s-70s manufacture. Molded in hard plastic with matte silver finish, this artful rendition in high 3-d profile can be a tasteful, discreet decoration for a study or collector's room. Includes provision to hang on the wall. $295.00 Attractive Cast iron Kasli statuette depicting a decorated Red Army soldier returning home to his daughter at the end of WW 2. Dated 1986. For more of the popular metal figurines and busts frequently seen in Soviet homes, particularly sculptures with military, space, or even political themes, please visit the Soviet Statuettes & Busts in Metal section of our website. $90.00 Bust of Maxim Gorky, dated 1981, a likeness of the writer as a young man - before the Revolution changed everything and turned him into a major Communist cultural icon. $25.00 Young Pioneer Parade Belt, circa mid to late 1980s. The organization included almost all kids from 9 to 14 years, and was a steppingstone on the way to becoming a Komsomol member. To see a large selection of the pennants and flags once awarded to Soviet citizens, please visit the Military, Propaganda and Awards Flags section of our website.